Visit London with the Elephant family. Fun is in store as twins Harold and Penelope travel from Africa with their parents. Join the adventure as the family tiptoes through historic buildings, rides the Underground, and enjoys traditional English food. But when Harold and Penelope disappear from the Natural History Museum, the detectives from Scotland Yard are called in to solve the case! Download a e-version of the book for your Kindle Reader from Amazon.com. Check your local bookstore for copies of the The Elephants Visit London. If they don't have it, ask them to order it. This is a hilarious chapter book about elephants who visit London to test out the waters so to speak. The Elephant family - Mr Elephant and Mrs Elephant and their two children Penelope and Harold - live in a small country in Africa where Mr Elephant is the Prime Minister. At the start of the story he has just been appointed Ambassador to London. Amid the preparations to move - MOVE!?! - they decide to visit London to see for themselves if they would be welcome. Knowing that elephants and humans may mix well in Africa but not necessarily in England, they decide to hide their true identity by donning disguises. They change their name to ELEFANT, and Mr and Mrs Elephant put on raincoats and carry umbrellas and the children wear school uniforms. Their disguises work. No one notices that they are elephants, not the taxi driver nor the bellboy at their hotel nor the desk clerk who instead focuses on their unusual name, which introduces what becomes a refrain: "Is it French, perhaps?" The Elephant family sallies forth into London. They have adventures on the tube (subway), in the park on their way to Buckingham Palace, on the top deck of the double-decker bus, in the British Museum, and the Natural History. Only one person, a child, sees that they are indeed elephants, but it doesn't matter because he is not believed. There are many extras in this book, starting with the strong black and white and blue illustrations throughout, the map of London at the beginning, and guides or glossaries at the end: What the elephants saw in London, what they ate (a translation of food terms), and a guide to British terms. There is even an email address so readers can send suggestions to the author about where the elephants should visit next. This is a thoroughly delightful book! 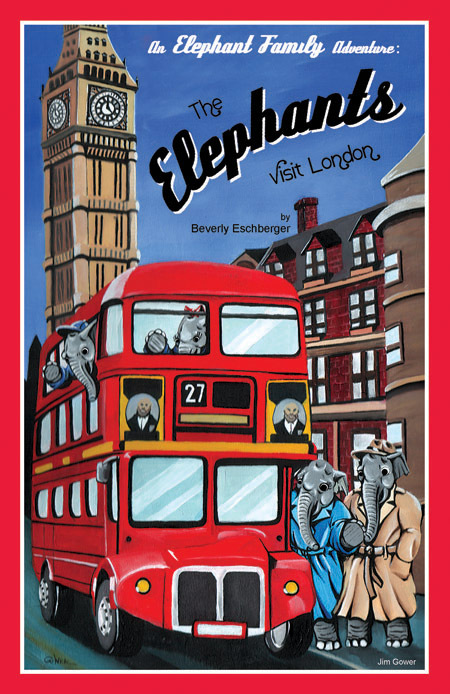 The Elephants Visit London is a delightful and inexpensive treat for young readers who have just discovered the joy of chapter books. Following the Elephant Family (two parents and their twin children Harold and Penelope - all of the bipedal elephants dressed in nice travel clothes) during their trip to London. The Elephants Visit London shows an elephant's-eye view of historic buildings, tradional English food, and the Natural History Museum. But when the twins suddenly go missing from the museum, detectives from Scotland Yard are set on the case! The last few pages offer lists to help young readers reacquaint themselves with British English terms mentioned in the book, such as "telephone call box" (telephone booth). A scattering of simple black-and-white illustrations round out this wonderful book, fun to read in its own right and especially recommended to help prepare young people for the culture shock of visiting London and England. A new family reading series featuring visits to interesting places is being introduced by Artemesia Publishing located in Albuquerque, N.M. The series is authored by Beverly Eschberger. The first book is illustrated by Jim Gower. The main characters of the series are an elephant family from Africa. In addition to the parents, there are 10-year-old twins named Harold and Penelope. Their father is given a diplomatic assignment to London in this first book. (In the back of the book is a page asking for suggestions from readers regarding future destinations for the elephant family). As a part of their disguises for the trip to London (just so they won't scare the English folks) they change the spelling of their name to Elefant. London offers great adventures. Riding in the "underground," visiting the British Museum, riding on a double-decker bus and eating English food are part of the orientation trips. There are lists of terms used in England which need a little explanation and other helpful information to make this book not only fun, but very informative. The print is easy on the eyes and the format is paperback. Children in grades 2-4 and their families will enjoy this geography page-turner. Future books offer promise for learning about other geographic locations. An Elephant Family Adventure: The Elephants Visit London has been named a Mom's Choice Awards Silver Recipient. 2008 New Mexico Book Awards Finalist for Young Readers Book.